There are few things in life that rival the pure unadulterated enjoyment of a well-planned and beautiful patio. The sky’s the limit as far as your imagination and budget are concerned. 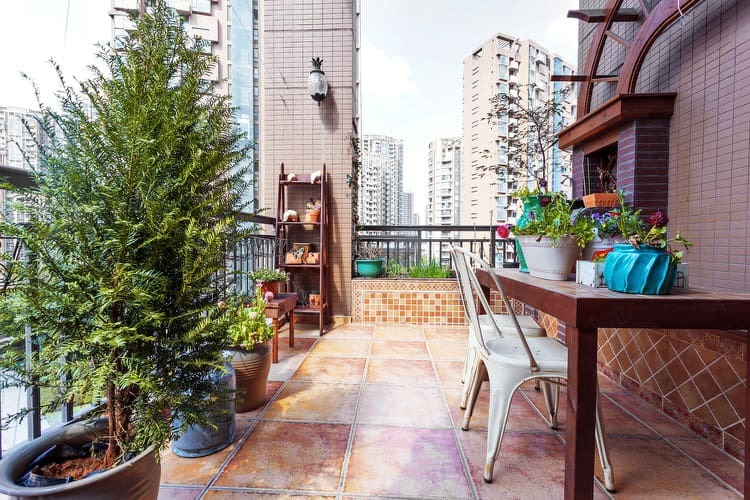 You can start from the ground up, undertake a major renovation project, or make some minor changes to reinvent your outdoor living space on a budget. Patios increase your home’s value by improving the landscape and merging indoor with outdoor spaces. 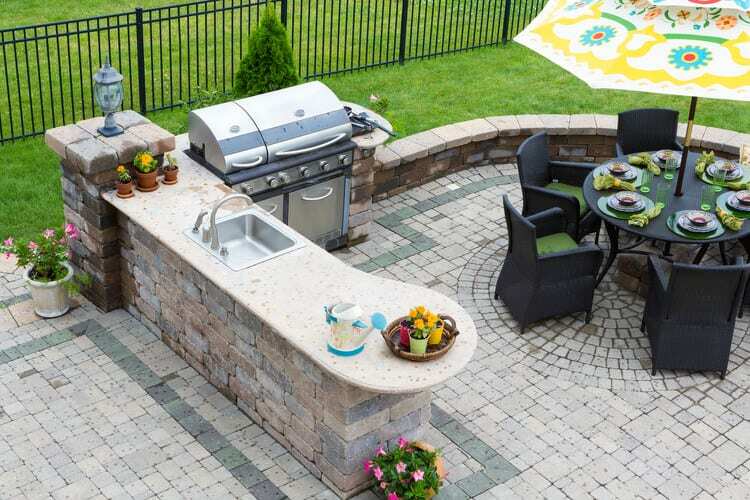 Choose from features like natural stone pavers, outdoor kitchens, patio covers, multimedia systems, living and dining furniture, water features and fancy lighting systems. Or you can create a simple and attractive spot for your table, chairs and outdoor grill. Don’t limit outdoor cooking to special occasions and summer holidays. The fully equipped kitchen here has the ultimate in gourmet accoutrement—a grill/smoker, refrigerator, sink, storage and even a dishwasher! But all you really need is a grill and a dining set to get your outdoor barbecue on. This Mediterranean-inspired patio is an earthy oasis in the city. A stone fountain adds Old World charm and along with the walls, helps block the sights and sounds of the nearby highway. There’s nothing more inviting than creating a living room on your patio. Decorate the outdoor space just as you would your interiors. Arrange a cozy seating group to promote conversation and relaxation. Make sure you include plenty of comfortable cushions and pillows. You’ll be using this outdoor space all summer long. 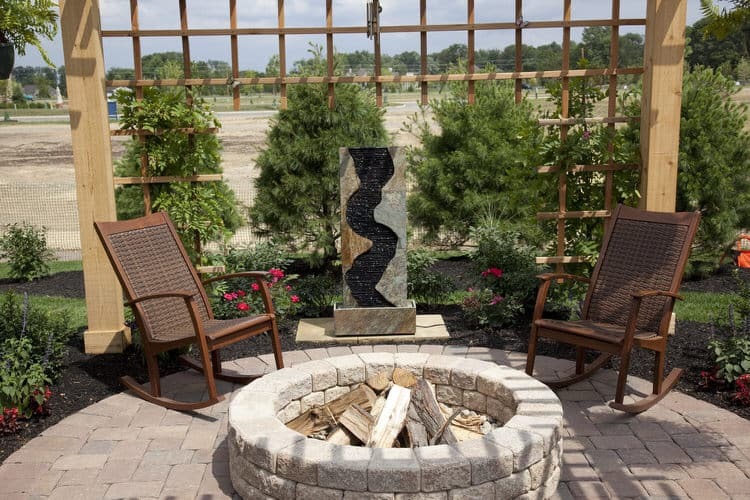 Consider furnishing your patio with unconventional pieces that can be switched out to create scenes that are worthy of an art installation. 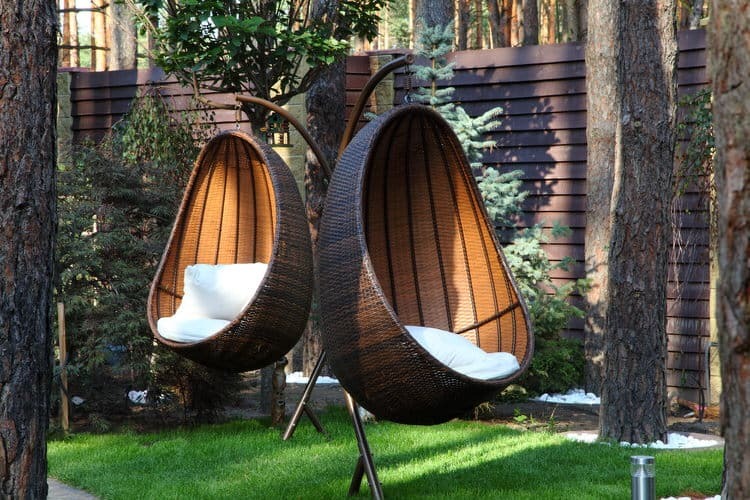 The hanging wicker egg chairs are on a stand and can easily be moved from one location in the yard to another depending on the time of day. Look for pieces with great patinas, unusual lines and interesting fabrics that will contribute to your artistic patio vibe. 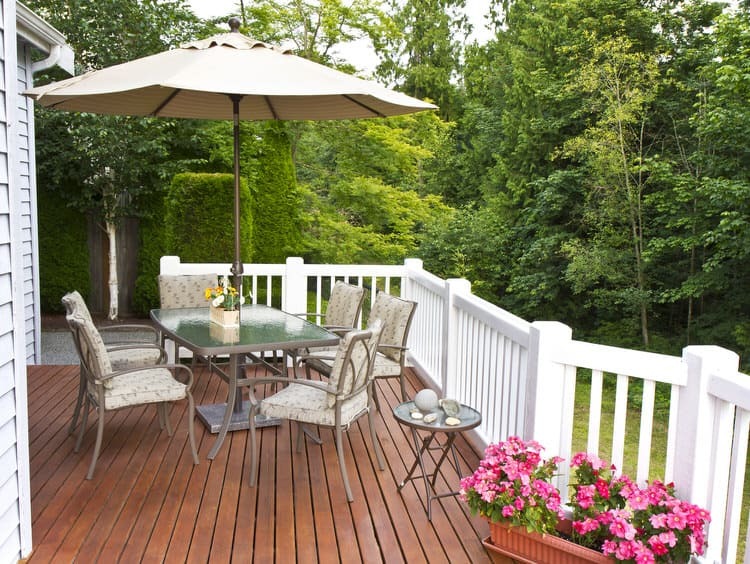 This modest deck patio right off the house is a great place for Sunday brunch, summer cookouts or a relaxing afternoon with a good book and a tall glass of iced tea. The homeowner dressed it up with planters brimming with impatiens and little accessories to make the space feel homier. You can make big changes with fabric. Give neutral patio furniture a kick of color with new cushions in fun outdoor fabric colors. If you can’t purchase replacements through the manufacturer, hire a workroom to create new cushion covers. 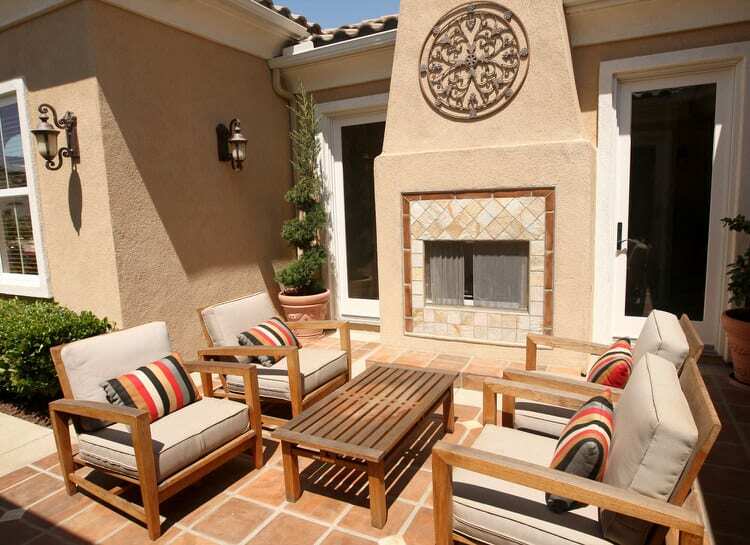 For this patio, the homeowner chose a warm red fabric to replace the blah tan. Warm colors make this little patio pop. The glazed Mexican urn was transformed into an impressive fountain in a matter of hours. Brickwork columns, bamboo fencing and a pebble floor add to the textural nature of this outdoor “room”. The folding bistro set and potted plants give the formerly underutilized space a genuine purpose. If you like the looks of a covered patio but don’t have the budget to fund or inclination to endure a remodel, consider a temporary fix. For a small investment, purchase a portable gazebo from the local home improvement center. Set it up once the weather warms up and enjoy it until the first frost. 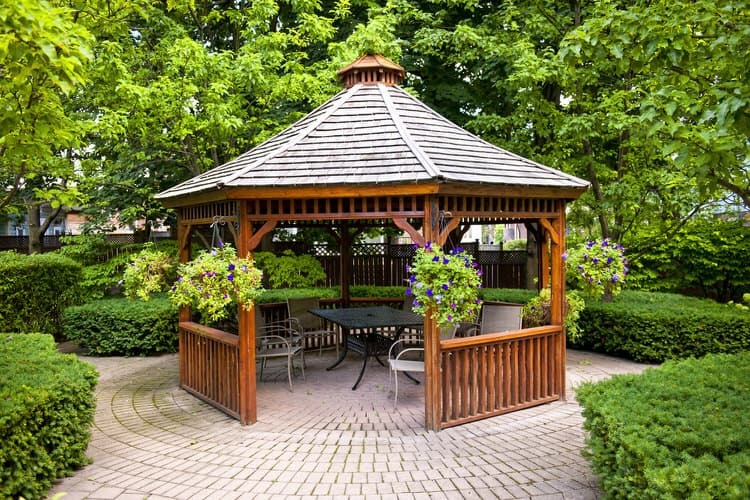 This pagoda-inspired gazebo is constructed of durable cedar and topped with a shake roof. The furniture consists of a basic bench, chairs and a small table. The huge hanging petunia baskets add life and color to this fun patio. What a great place for afternoon lemonade or sangria! This retro wicker seating and dining collection was a brilliant flea market find. It recently took its place on the side patio when the owner decided to spruce it up with a coat of paint and new cushions. 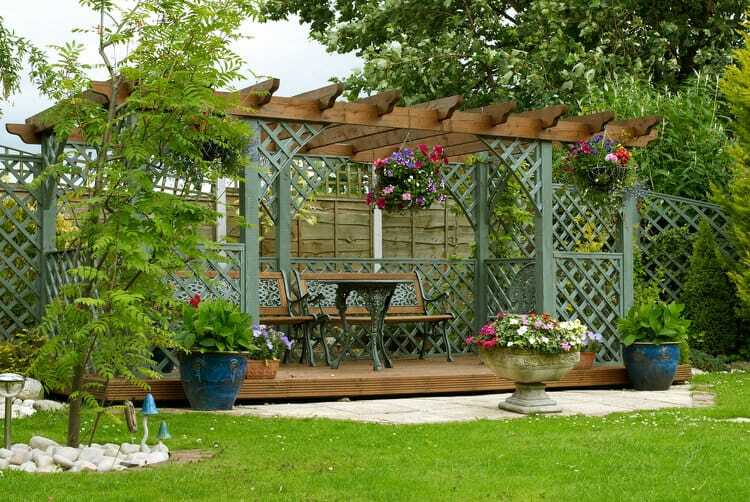 The white paint matches the pergola perfectly. The chair cushions match the dining umbrella. Graphic black and white chevron pillows enhance the mid century look. Don’t have a patio surface? Create one in a weekend with an underlayment of crushed stone, patio pavers and sand for filler. 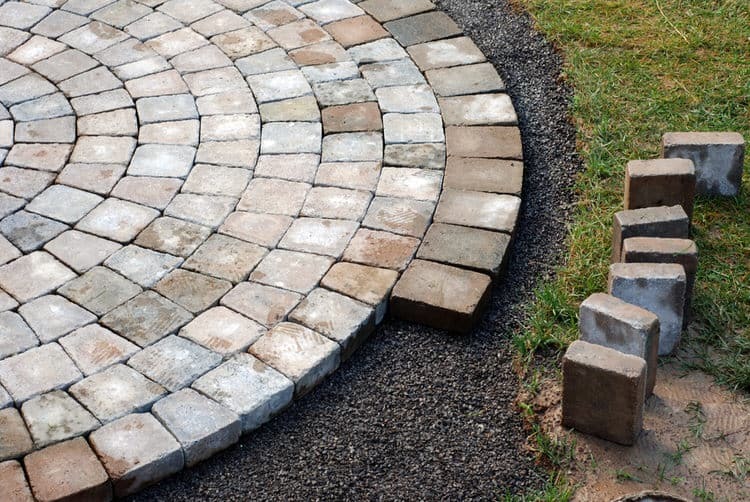 A mortarless paver patio is as close as you can get to a failsafe project. Your main concern is making sure the area is completely level before you start. Find instructions online or advice from your home improvement center. You’ll be sipping your Sunday morning coffee outside before you know it! This indoor-outdoor patio totally works thanks to the atrium-style design that floods the room with light and opens up views to the yard. 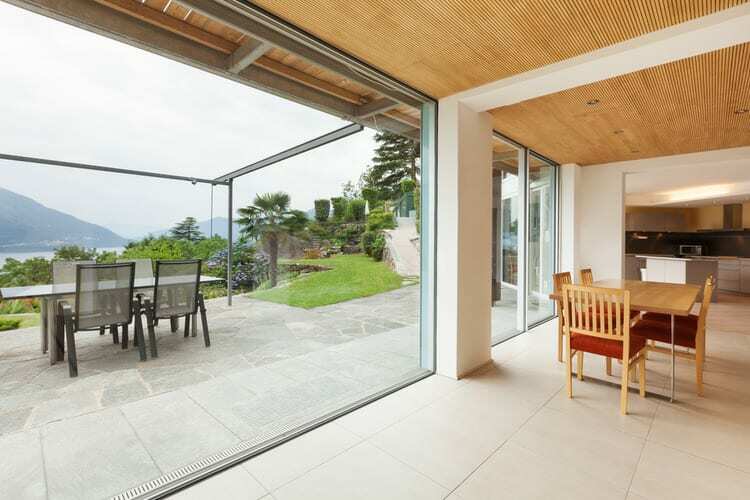 The space, while enclosed by glass, houses an outdoor grill, which is vented to the outside. The homeowner opens the French doors and casement windows on the warmest of summer days to circulate the air. 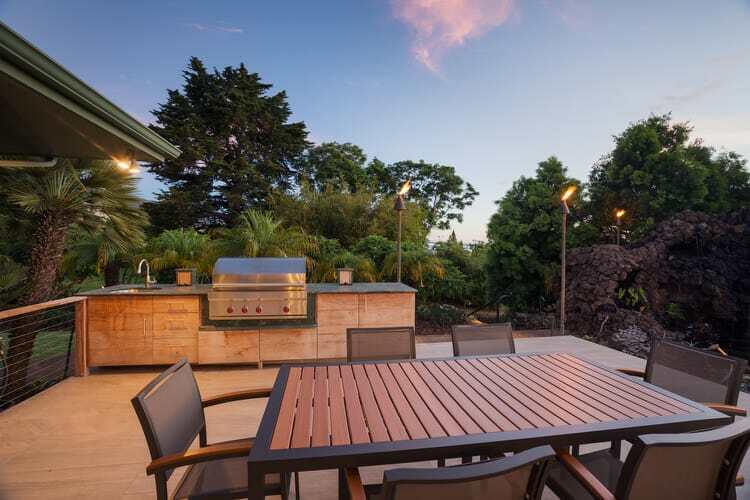 All patios can benefit from mood lighting and this one is no exception. The tiki torches installed around the perimeter provide a South Pacific feel to outdoor gatherings. These are gas torches that don’t rely on stinky oils and refills to keep the party going. The commercial torches are fed by clean burning natural gas just like the grill. Open to the back yard on three sides, this Colorado patio has all the comforts of home in the great outdoors. The owners utilize the space year-round—except during periods of heavy snow. It is the perfect place for cocktails and good conversation. The stacked stone fireplace is obviously the focal point of the space. The clean lines of the faux wicker furniture seem to work with the fun and funky handcrafted pizza oven and metal countertop. The talented homeowner fabricated the wire base and metal countertop for the pizza oven in his metal shop. The base was moved on site and filled to the top with colorful river rock. Lush bamboo and leafy vegetation enclose the space adding color and creating an additional layer of privacy. 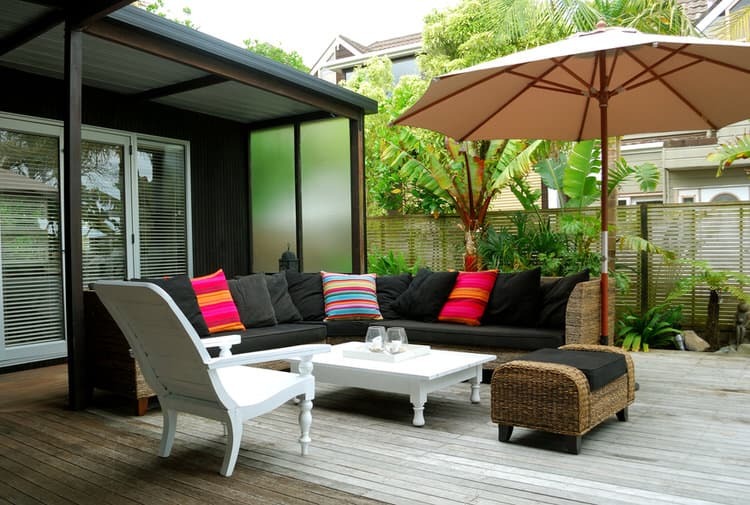 Your outdoor rooms should act as an extension of your home. 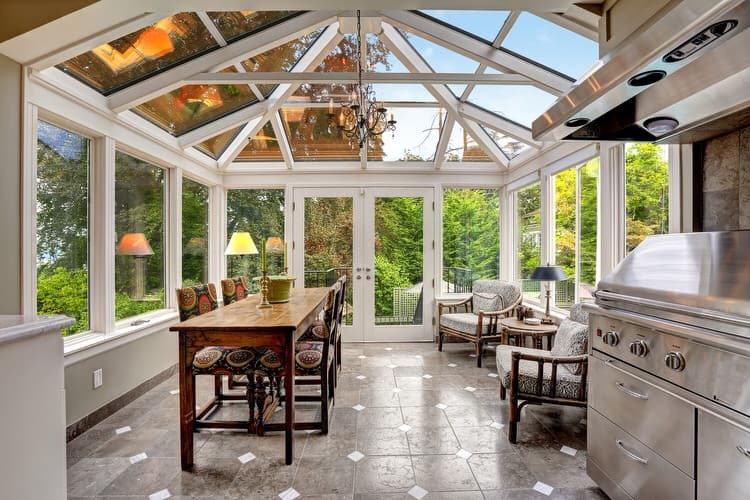 For example, you could expand your bedroom by installing French doors leading onto a private courtyard, or make a combination kitchen/dining space seem even larger by opening the doors to your outdoor dining area. On this Scottsdale patio, everything in the space is meant to complement to desert view. 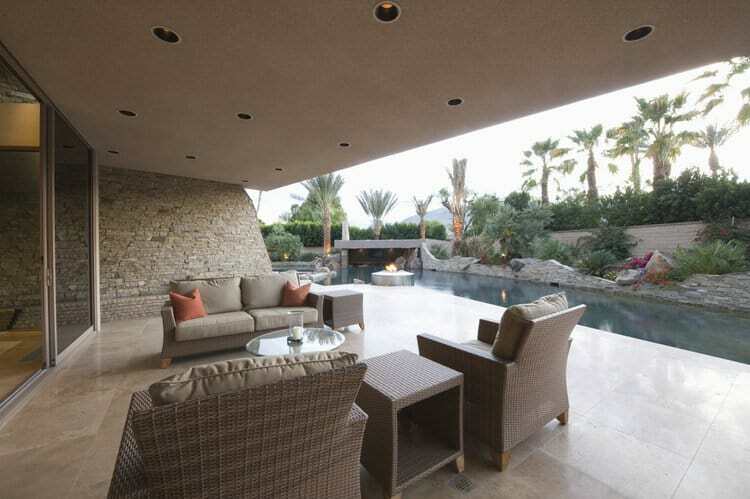 The patio surface, furnishings and pool deck blend in with the neutral color palette of the desert landscape. The generous overhang contains an integrated misting system to keep things cool when the temperatures heat up. 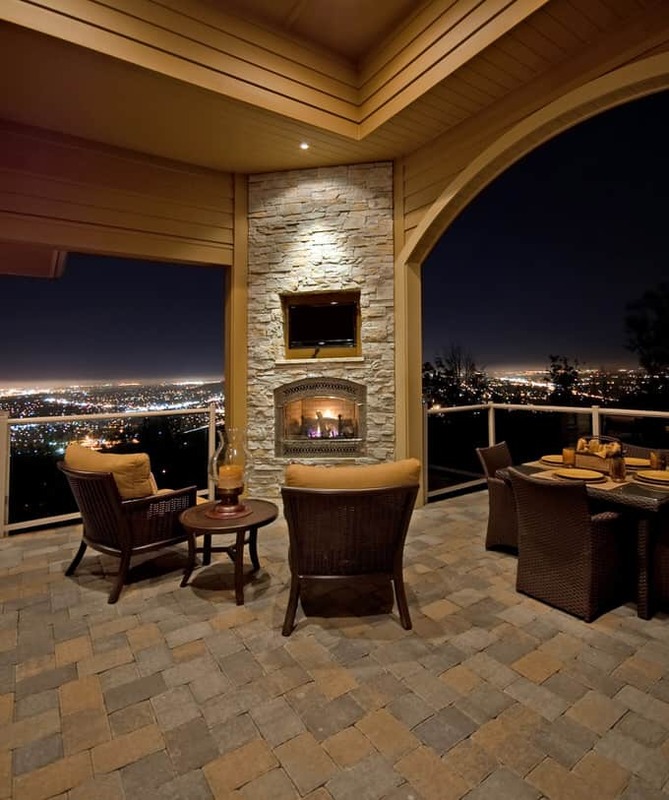 Without proper landscape lighting, no one would see notice the details of this gorgeous patio at night. 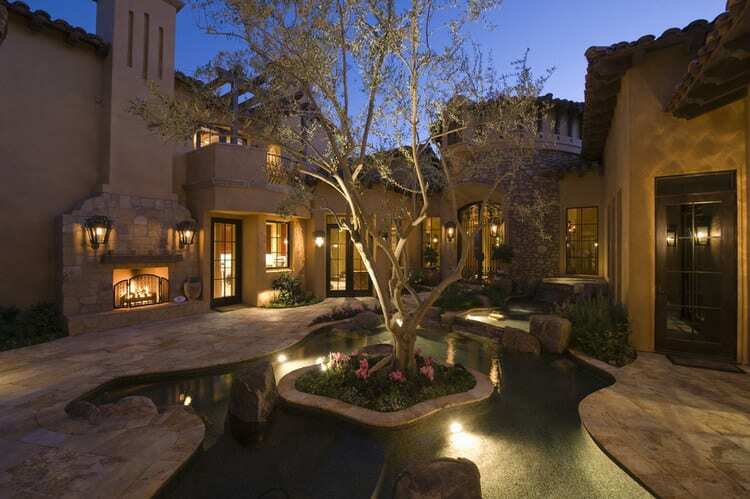 Outdoor patio fixtures illuminate the olive tree and courtyard pond and augment the glow from the fireplace and indoor lighting. This ingenious homeowner needed to create a glamorous spot for an outdoor cocktail party. The ordinary patio was transformed into a hip lounge with the addition of a crystal chandelier and strings of colored lights hung among the tree boughs. The subtle yet striking effect gives the patio the feel of an upscale club. 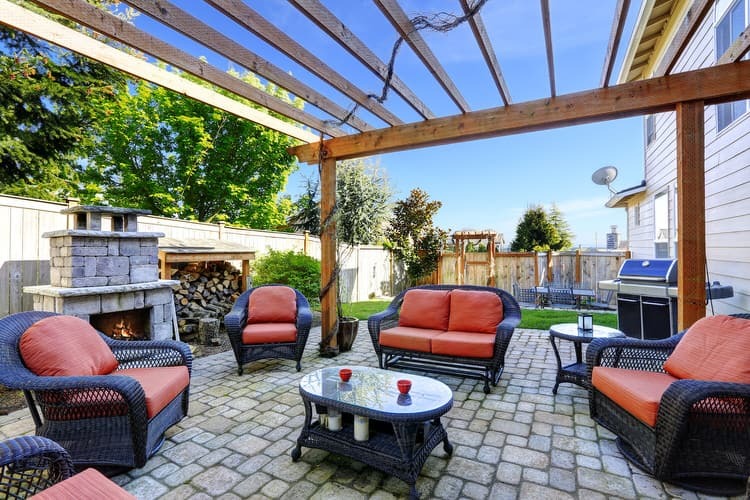 Small lots can easily accommodate separate outdoor living areas. The diminutive deck takes up every bit of this 500-square-foot space. 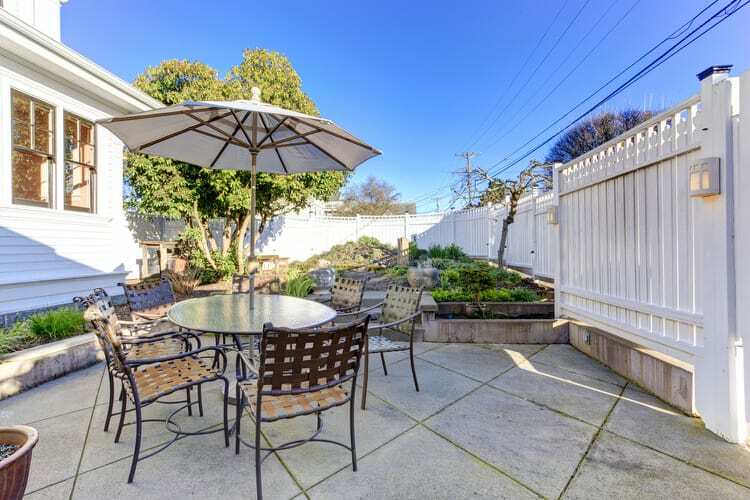 The backyard patio has plenty of room for a casual seating area, dining table and outdoor kitchen. 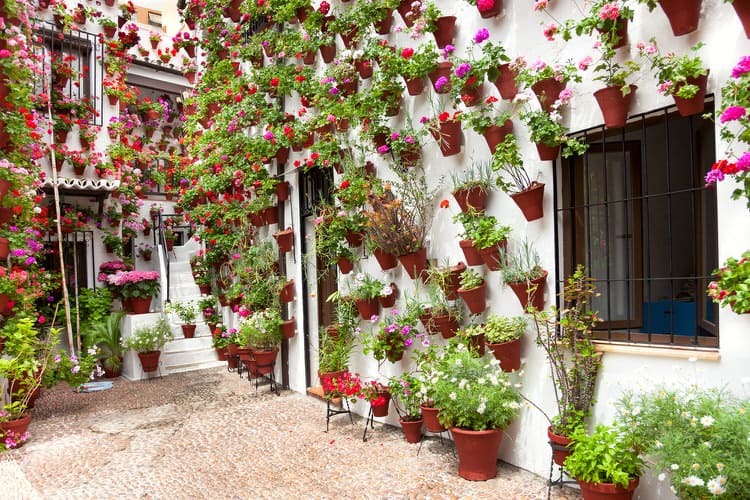 This lovely flower-filled stucco courtyard in Cordoba, Spain can serve as inspiration for your patio. While you may want to cut back on the number of flowerpots, this is an easy way to provide color and a whimsical touch to any outdoor entertaining area. Simply purchase wall-mounted flowerpot holders or fashion your own out of wire and attach them to walls or fencing. Flower filled terra cotta pots create a living wall. Saltillo lights up this Santa Fe patio with color and ethnic ambiance. These Mexican tiles are a favorite among owners of pueblo style homes. Saltillo tiles are clay-based and have a handcrafted appearance. 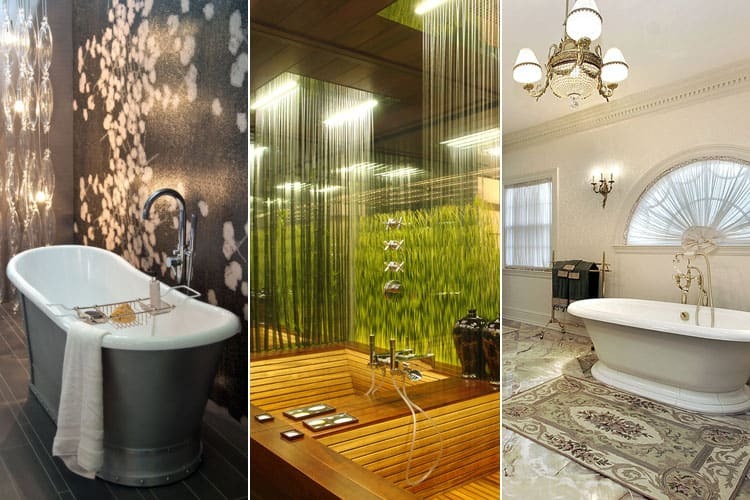 The surface is beautiful, but somewhat porous and less durable than ceramic tile. Seal them for outdoor use. Poolside patios should have partial cover to protect family and friends from overexposure to the sun. 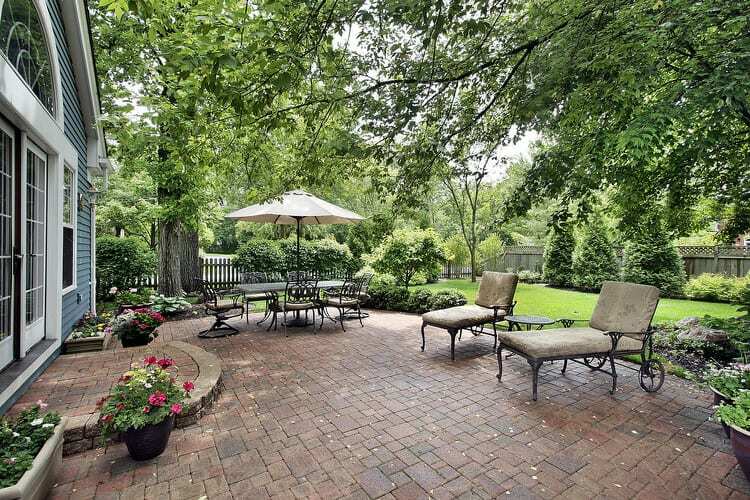 This fabulous home has plenty of covered areas designed for relaxing and dining. If your pool area lacks a patio cover, consider using freestanding and table umbrellas to improve everyone’s comfort and safety. 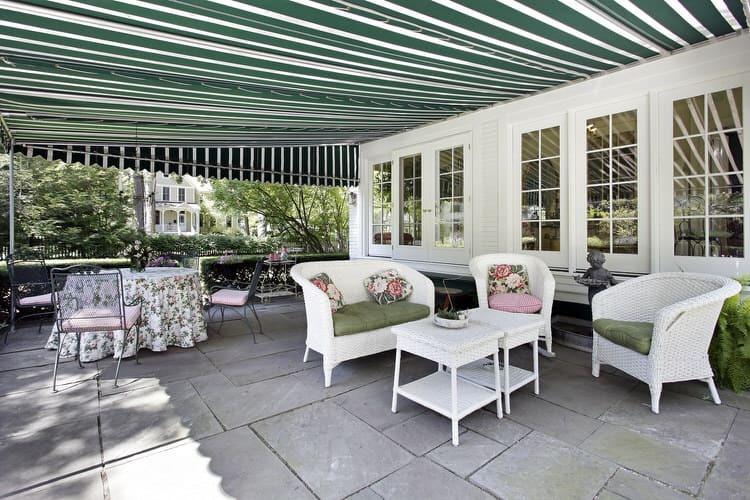 Use your patio on sunny or rainy summer days by installing a retractable awning. Enjoy the sun in the morning and extend the awning to shield the patio from the intense afternoon rays. The shade will also help cut your summer electric bills. Choose from hand crank or motorized models. Transform an unused area of your yard into a welcoming patio by installing an attractive pad with pavers, flagstone, gravel, wood or poured concrete. 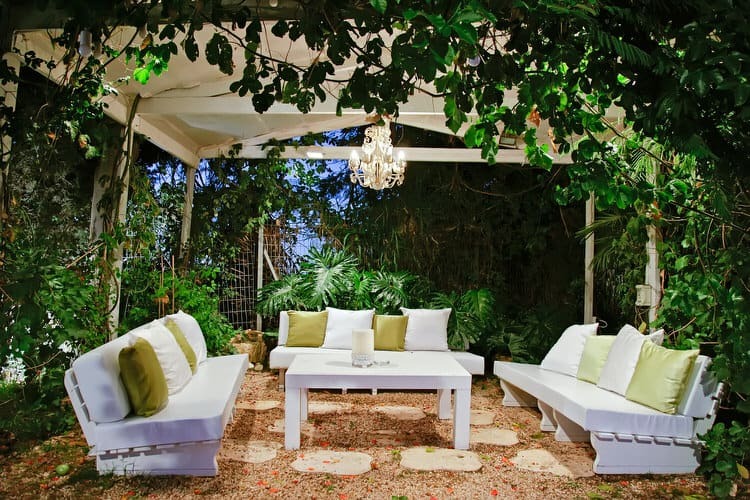 Select furnishings that suit your outdoor lifestyle and accessorize with container plants and lighting. 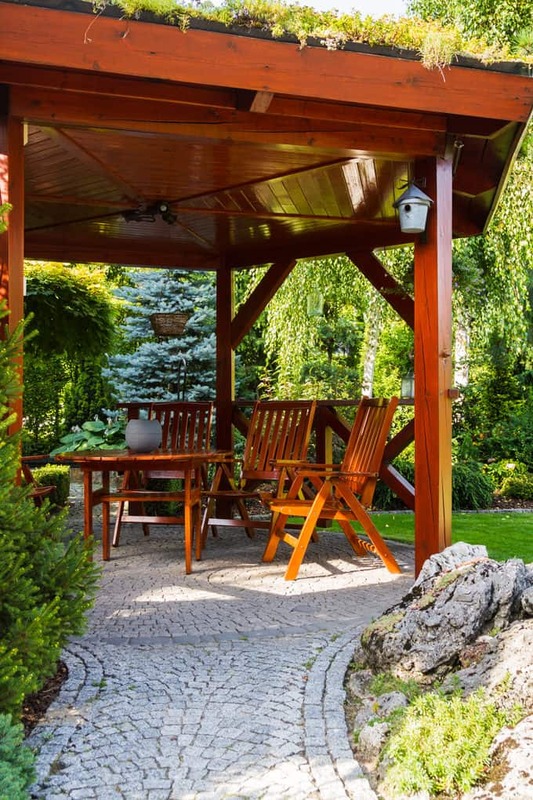 When planning a pergola for your patio, consider using reclaimed lumber. You will lessen the demand for newly harvested lumber and reclaimed is much stronger than newly cut wood. If you use FSC lumber, it can help your remodel earn LEED certification. This open-air dining and entertaining addition features reclaimed redwood salvaged from an abandoned sawmill in a neighboring town. 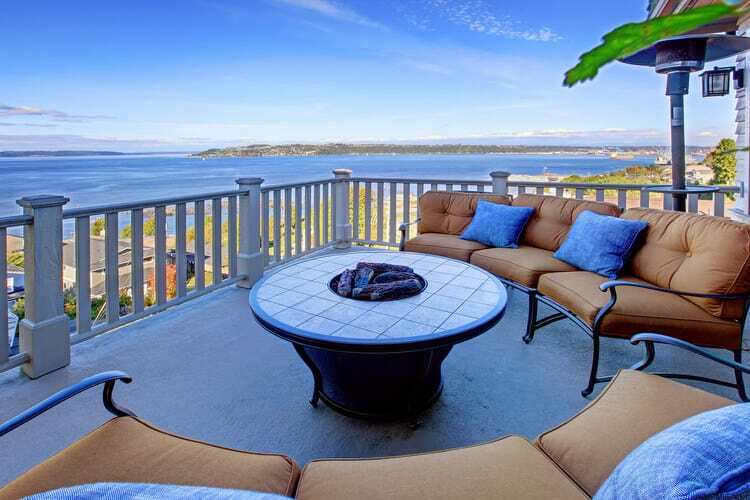 This seaside patio deck is a space the homeowners use from dawn until bedtime. They created a comfy seating area with two curved sofas fitted with overstuffed cushions and blue pillows that pick up the color from the fire pit tile. The space is equipped with little comforts like heat lamps, speakers and soft lighting. This deck, dining and hot tub combo creates the perfect spot to unwind with a glass of wine after work. The teak table and chairs have seen many breakfasts, lunches and dinners over the years. 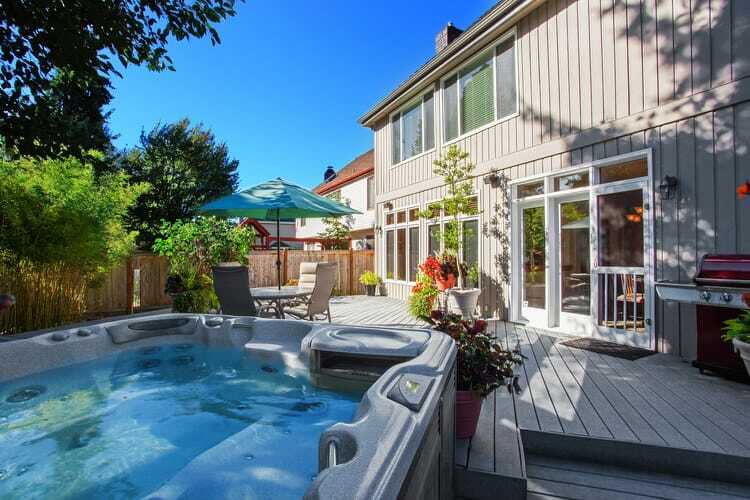 The hot tub is used year-round and has soothed many an aching back. This patio makes the most of a small backyard. 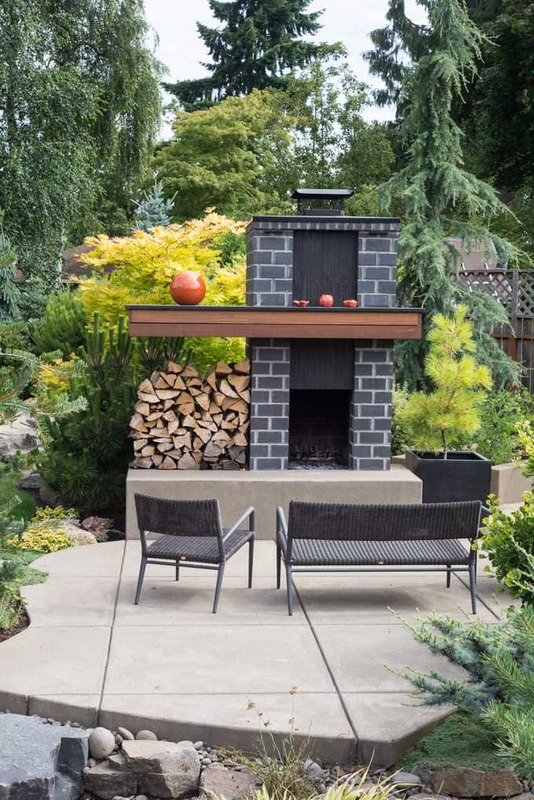 A modern patio design looks stunning amid the fir trees in this northern Oregon yard. The sleek fireplace features a generous hearth and asymmetrical ledge for displaying decorative items. The custom sofa and chair provide stylish seating to savor the crackling fire—it’s an ideal winter hangout. 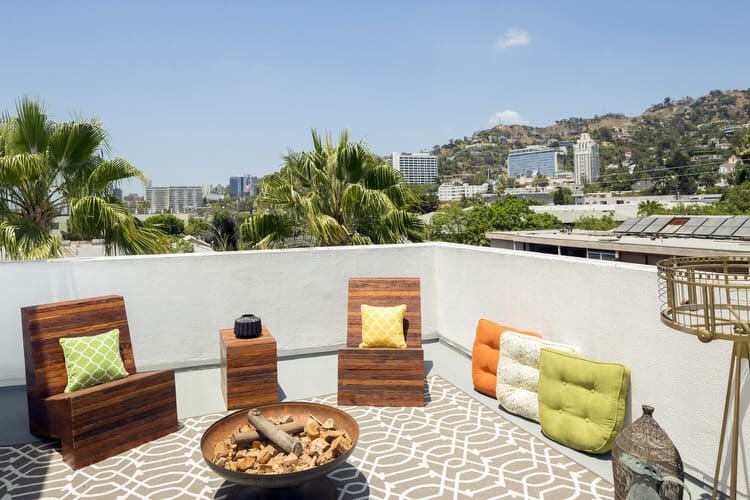 Increase your patio’s appeal and functionality by including plenty of accent tables to accommodate guests. 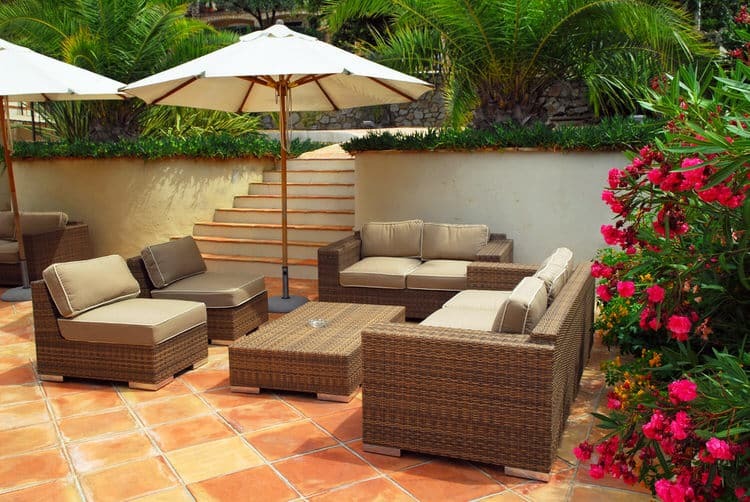 Choose furniture fabrics to complement the exterior features of your home. Inject color and movement with potted plants and flowers. 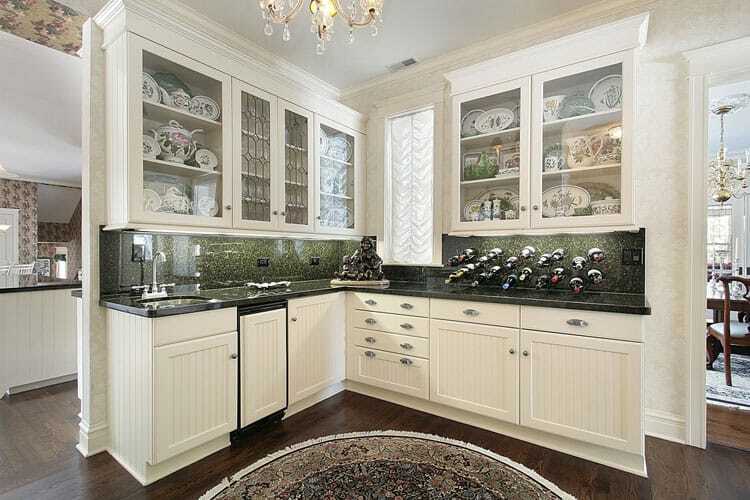 Choose materials that withstand the elements and become more attractive with age. 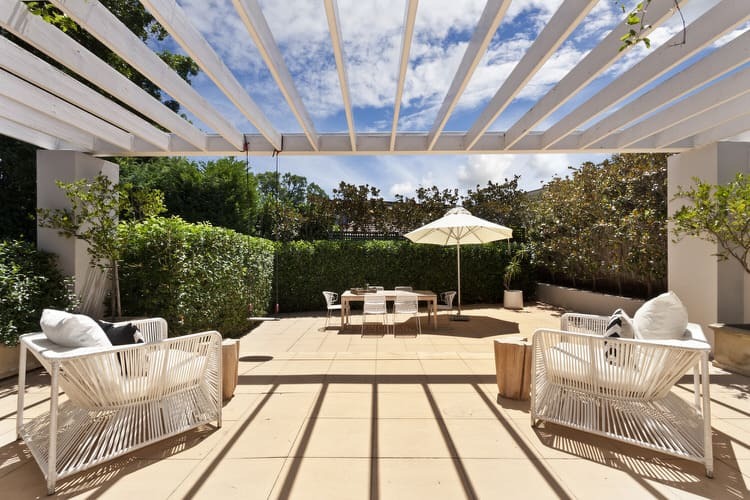 This garden patio complete with a pergola and lattice detail features minimal furniture pieces—only a bench and diminutive table. The little hideaway beckons guests to pause and reflect in the far reaches of the property. Outdoor textiles have come a long way in recent years. Not only do they come in a wide variety of colors, textures and patterns, the fabric quality has vastly improved over the weather resistant fabrics of yesteryear. The classic linen-look of the chair cushions is the perfect neutral for lively Navajo stripe lumbar pillows. 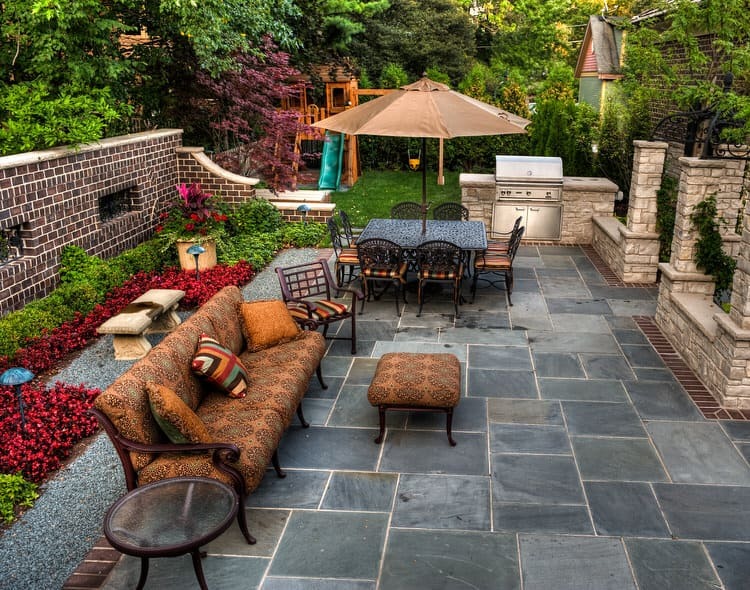 This slate patio makes a versatile backyard retreat. 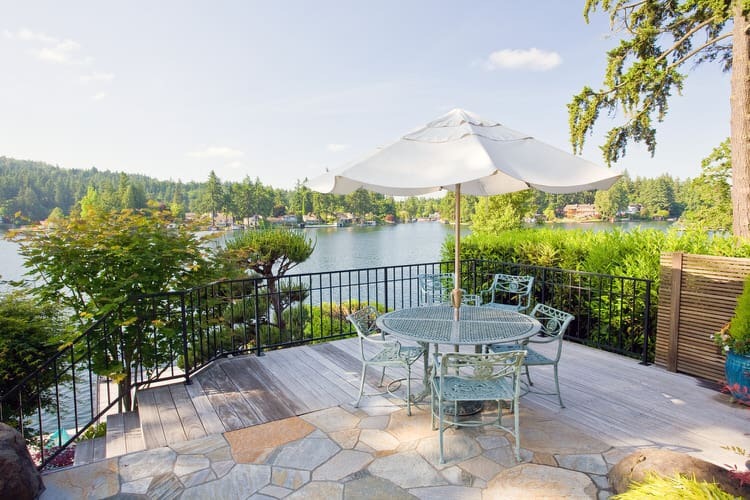 While small, it takes advantage of its limited footprint and fabulous lake views. While currently set up for dining, the addition of chaise lounge chairs change the nature of the space. 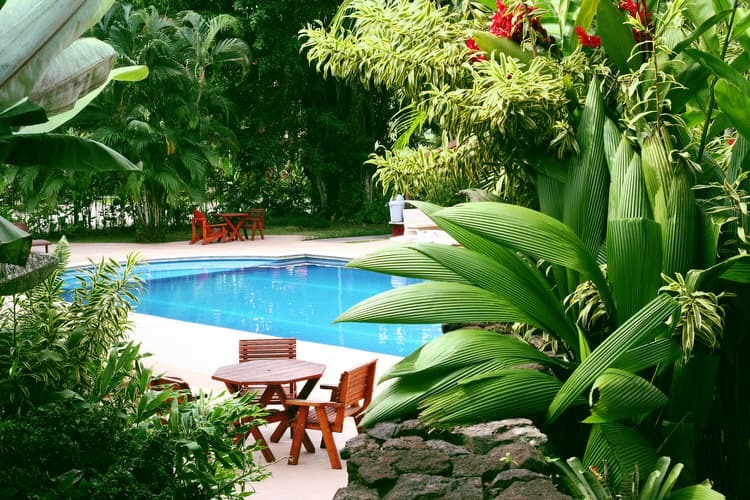 Surrounded by trees and lush vegetation, it becomes an ideal sunbathing spot. Rugs can completely change the look of an outdoor space. 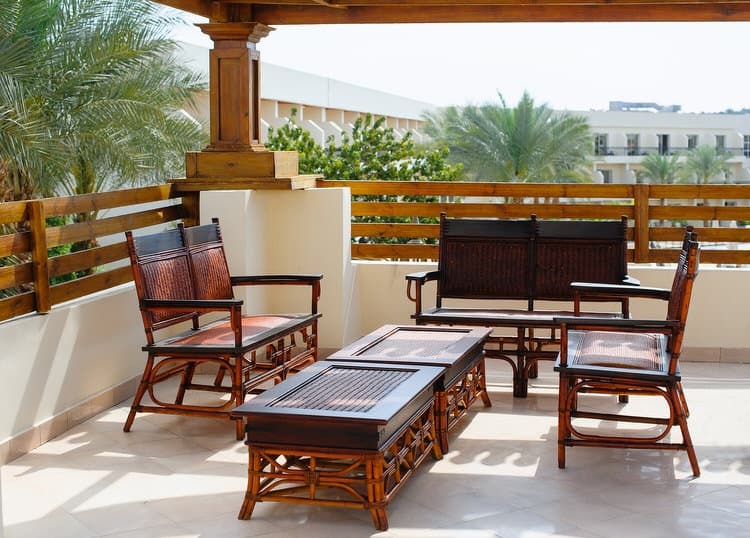 They creates harmony and gives a patio that warm touch that can’t be achieved with furniture alone. When shopping for an outdoor rug, make sure it is waterproof and resistant to mold. 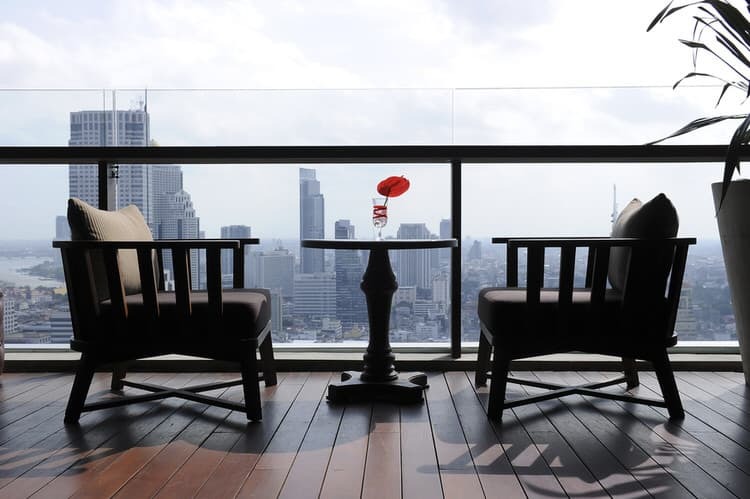 High above the city, this little terrace has a big secret to share. The space is located upstairs and away from the kitchen and dining room of the apartment. To make outdoor entertaining easier, the owner has created a patio pantry to house essentials like paper places, plastic cups and utensils, linens, serving pieces and a few decorative accessories for party time. 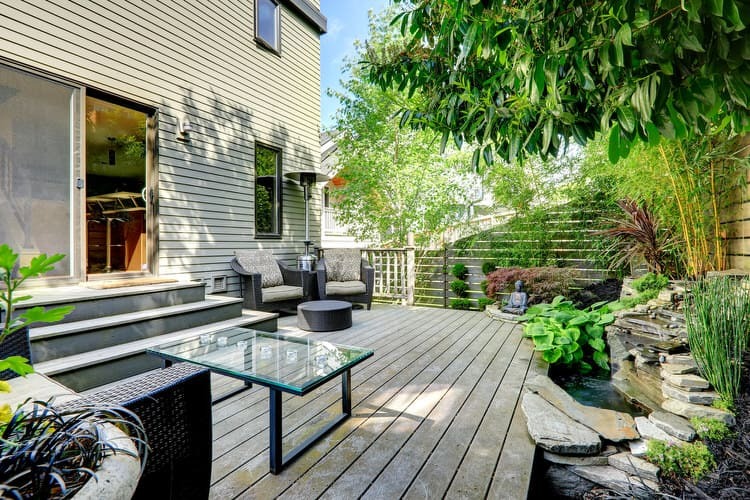 Trees help define this adorable urban patio. A simple table and chairs provide an area for al fresco dining on the compact composite deck. A rock garden borders the space and thoughtful plantings complete the cohesive design. What was once a shed on the property is now a rustic patio ramada. The walls of the cedar shed were removed and the upcycled lumber was used to make the camp style table and Adirondack chairs. 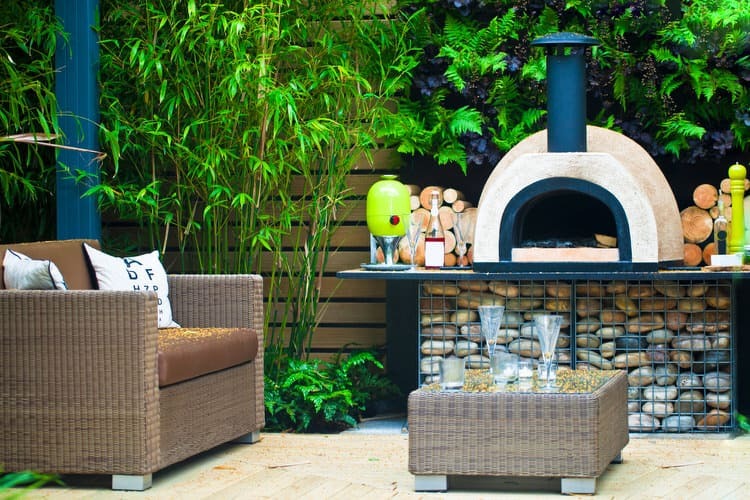 Give your outdoor space the look of an interior room with a few simple tips. Bring indoor elements out. Decorate like you would inside your home. Establish different zones for living, entertaining and dining. Keep your furnishings and surfaces clean. We all need a quiet place for intimate conversation or catching up on the latest best seller. All it takes is a couple of chairs and maybe a surface for drinks. This patio goes the extra mile with a grid patterned garden wall, a trickling water feature, and warm and inviting fire pit. The rocking chairs make it a place you’ll find hard to leave. This poolside patio resembles a chic club with its low bench seating and cocktail table. Pale blue seat cushions and bright white pillows pop against the tans of the wood wall and flooring. 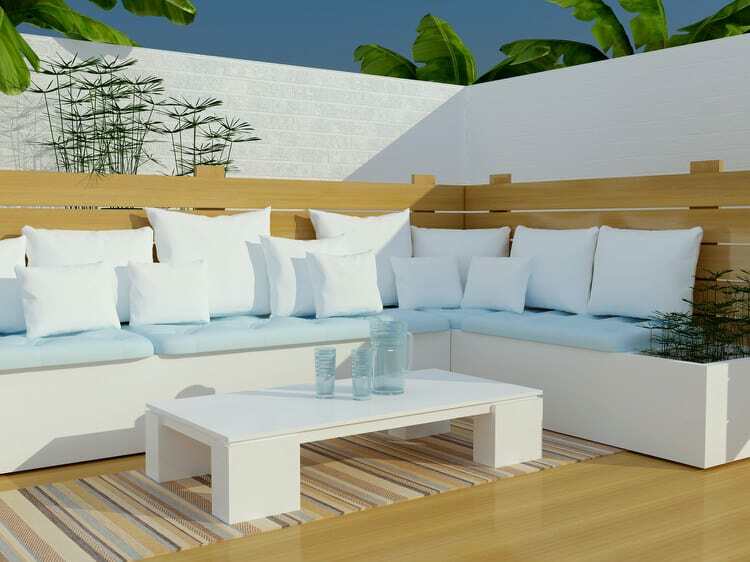 The cabana stripe runner adds to the cool vibe of this outdoor lounge. 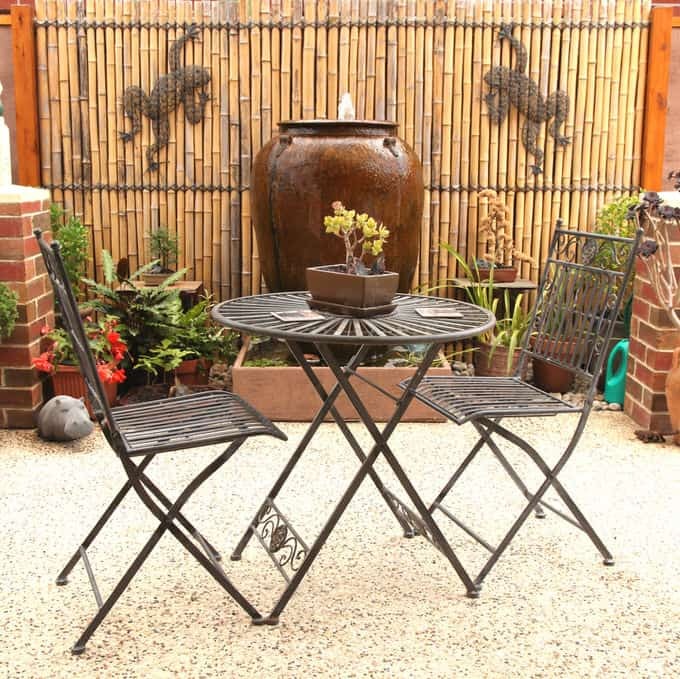 Considering a patio redesign? 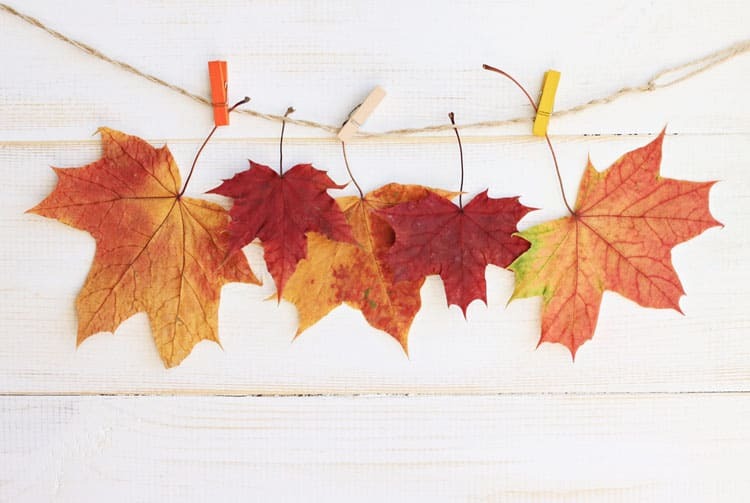 Take your color cues from your home’s exterior to create a harmonious look. 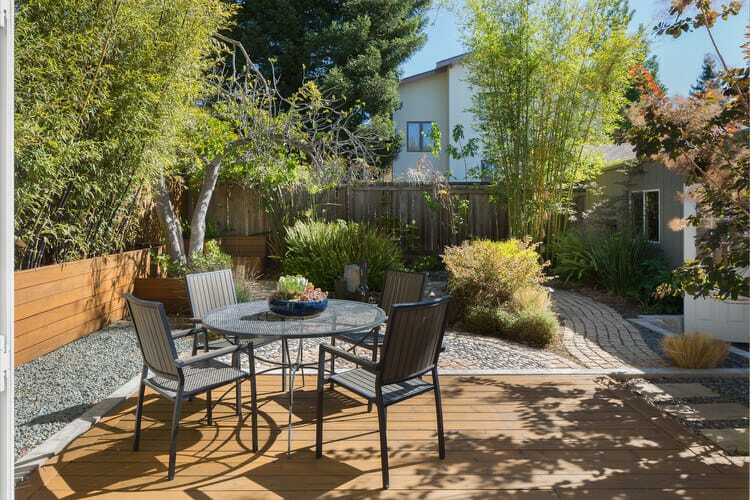 In this side yard dining area, everything ties in with the house and picket fence. No detail is overlooked—even the brown from the window frames is picked up by the wrought iron dining set. How’s that for a nightlight? 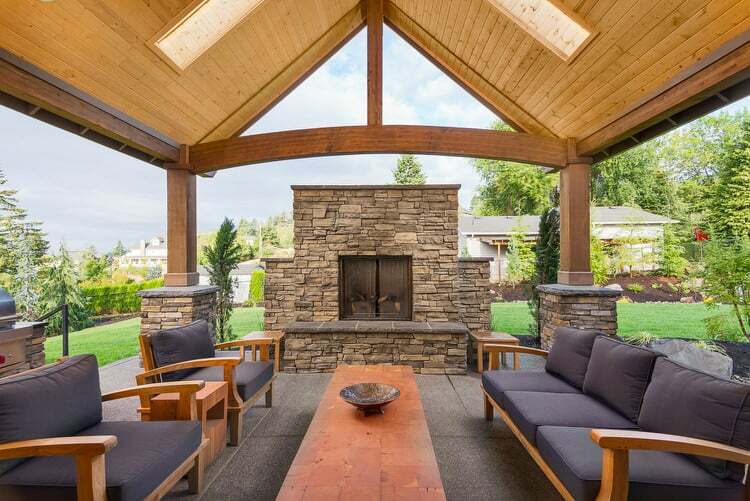 In this patio under the stars, the focal point is the lustrous pendant centered over the outdoor living area. The mid century seating and light design echo the architecture of the 1950s California ranch. The stone colored palette and soft lighting draws guests into the space like moths to a flame. How about a table for two on this sleek penthouse patio? Wood decking is an interesting material choice for an urban rooftop patio. 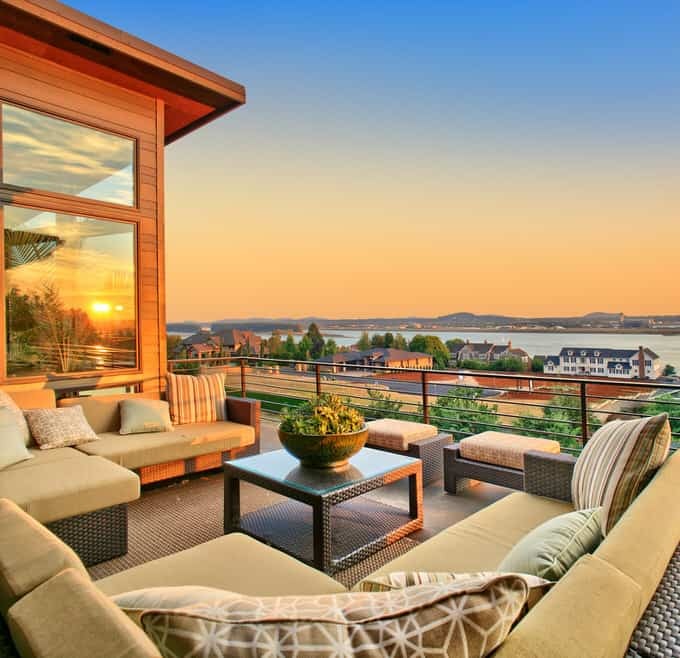 The comfy lounge chairs and accent table make this a great spot to share wine and conversation, watch the sun set and take in the magic of the city at night. 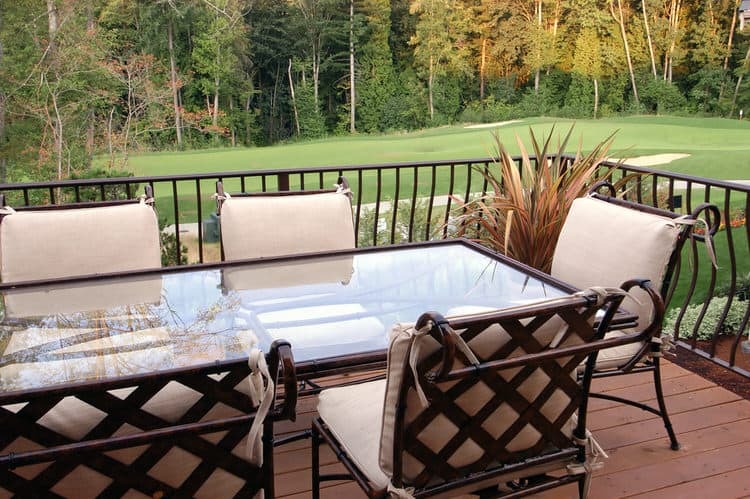 This condo is on a golf course with manicured landscaping and a palette of natural colors. The look is repeated on the deck with plants, wood tones, rich wrought iron and crisp linen cushions. The subdued hues look marvelous against the verdant backdrop. A view of the sea is really all you need to relax. However, this stunning terrace sure doesn’t hurt. The rattan and tanned leather seating and tables can be configured any number of ways depending on the occasion. Keeping the space neutral and the furnishings simple allows you bring in other colors and furnishings to change the look when the mood strikes. After an extensive remodel, this hillside patio turned into the family’s favorite room of the house. It is accessible through several sets of French doors making it the ideal place to spend evenings enjoying the new fireplace and views of the town below. 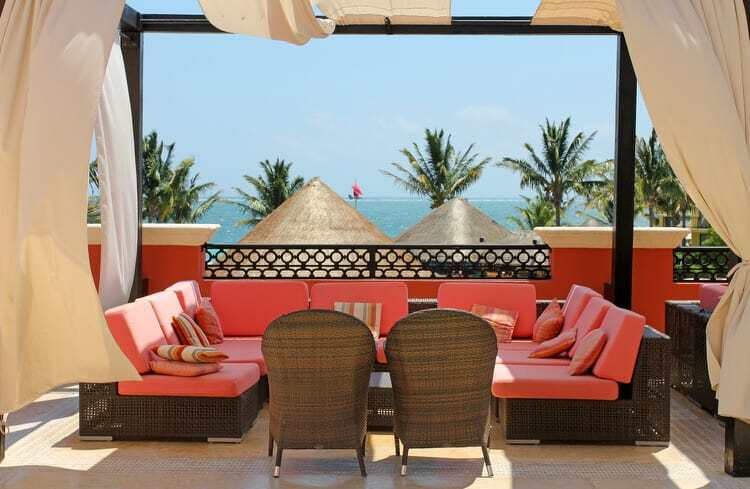 The cheery red cushions, low sectional seating and striped pillows of this patio might be fitting for a Bedouin tent. However, this scene is of the seaside rather than the Sahara. Flowing fabric panels billow in the breeze creating an exotic cabana-like feel.